I have a love affair with soup, hopefully, I’m not alone when I say “I love soup.” We make soup in our household at least once a week. Grab your Instant Pot or slow cooker of choice and let’s cook and eat more soup! When it’s chilly outside there is nothing like a warm bowl of soup to warm you up. I have always enjoyed cooking. It is something that goes back to spending time in the kitchen with my Mom learning how to follow a recipe and measure out exact ingredients. The main ingredients of soup are simple. Most soups have a combination of broth, vegetables, protein, and starch. While the broth serves as the base to your soup, things like canned tomatoes or even water can be used in soups that are going to have bold ingredients that stand on their own, like broccoli soup. You can choose to add a starch, which is a complex carbohydrate that breaks down slowly in the body, helps provide sustained energy, and keeps you feeling fuller longer. In addition to the well-loved pasta, rice, and potatoes, other starch options include beans, lentils, barley, or quinoa. Once you’ve got the broth + veg + protein + starch equation figured out, then you get to add the fun stuff, like garlic, spices, and even wine (in the soup or in your glass, both are acceptable). Choosing 1-2 vegetables to feature is easy based on what’s already in your fridge or what is in season at the farmer’s market. Then, add your favorite protein, like chicken or sausage to your soup. If you have a leftover protein you can simply add it, or if you have raw meat, consider browning it first to bring out a deeper flavor. There’s a debate about whether to “brown” or “not to brown”, but I’ll leave the choice to you. Following a certain lifestyle or meal plan? Trying to replicate Grandma’s famous chowder without some of the high-calorie ingredients? It’s easy to make substitutions and still enjoy all your favorite soups. Try using cauliflower or rutabaga instead of potatoes, which are lower in carbohydrates and higher in fiber. Since traditional flours can irritate anyone on a gluten-free diet, try adding mashed beans or pureed vegetables for added flavor and nutrients, or using a flour alternative like coconut flour or arrowroot powder. And if you’re lactose intolerant and thought you had to give up the rich creaminess of potato soup forever – think again! Coconut milk is a great alternative that is lactose and cholesterol-free and rich in many other nutrients like selenium and zinc that help improve immune function. Try adding extra protein by cooking up whatever you have in the fridge – ham, sausage, and ground meat all work great. If your store-bought chicken noodle is lacking some flavor, sauté up some onions and garlic or add your favorite spices. Aiming for your 2-3 cups of veggies for the day? The hands-down easiest thing to do is add frozen veggies. Mixed veggies, peas, carrots, spinach – anything goes here. And with both high protein and fiber content, adding beans is another great option. White beans work great in soups with a clear or creamy broth and darker beans are great for tomato-based broths. Before you wrinkle your nose, ever wonder what your grandmother was simmering on the stove top for hours or even days? Bone broth is made by slow simmering beef, pork, or poultry bones with vegetables for up to 48 hours. If you ever cook at home, chances are you already have the ingredients around in the form of discarded ends of carrots and celery and leftover bones from your rotisserie chicken. Bone broth is a great base to any soup that is full of amino acids and other nutrients that support a healthy immune system and help decrease fatigue. And unlike store-bought broth or soup stock, a homemade bone broth is naturally low in sodium. Curious how some restaurants make soup taste so good? Consider these tips that your favorite restaurant might be using. Add a parmesan cheese rind or mashed anchovies to your broth while your soup simmers for a more savory umami flavor. 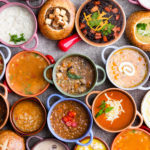 To add a brighter richness to your soup, add some acidity, like apple cider vinegar, lemon juice, or wine; but start with just a splash right at the end of cooking, taste, and then add more as desired. For thicker soups and stews, consider adding eggs on top, covering, and letting cook to your desired temperature. If this sounds crazy, check out the popular North African dish Shakshuka for some inspiration. Blending can create a creamier consistency without adding dairy and works great for things like tomato, butternut squash, or mushroom soup. And if you feel like getting creative, make an herb sachet with herbs like bay leaves and thyme, let them simmer in the broth and remove before serving to add a delicious aroma and flavor to your soup. Winter weather got you feeling down? Clear your sinuses by sipping on soups with a spicy component, like jalapeno, and give your immune system a boost with ingredients like ginger and garlic. 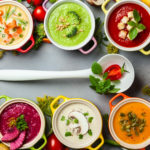 We’re familiar with the soul-warming properties of a bowl of chicken noodle, but consider cold soups like gazpacho during the summer to cool you down. And since all soups have a high water content, they can keep you hydrated and you will feel fuller longer any time of the year! 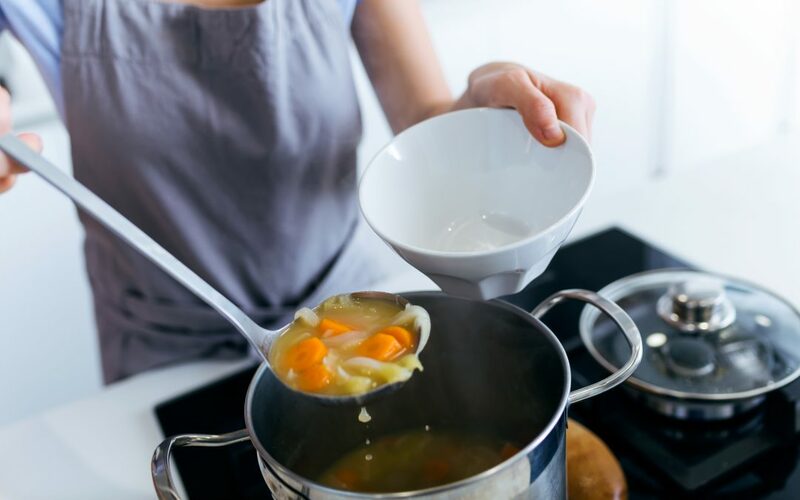 Almost anything can be fixed by adding more broth, but if your soup tastes too salty, try adding ½-1 cup more starch or 1-2 teaspoons more acidity at a time until desired saltiness is reached. The acidity will also help neutralize a soup that is too spicy or you can add coconut milk, cream, or even a dollop of Greek yogurt on top to help cool it down. And if your soup is just, well, lacking, step outside the box with the tips in #4 or these other options: add a spoonful of your favorite mustard to your chicken noodle; stir in some fish sauce (ignore the smell) or top your ramen with kimchi; mix in harissa sauce or tomato paste to any soup for a deeper color and texture; zest a lemon over ham and bean soup; or splash some Worcestershire sauce or coconut aminos into your beef stew. Stacy Senick is the Team Lead of the Wellness Program Management Team at Blue Cross and Blue Shield of North Carolina. She believes in the healing properties of exercise, nutrition, and mindfulness. She is an at home chef, avid podcast listener, and enjoys exploring the outdoors of North Carolina.